There were also CTF 1LE's built this year as test models. Some of them will be re-sold to dealers and had different VINS then a production 2013 1LE. The CTF VINS started with D9799XXX. Nobody knows for sure how many were built. 1LE offers one 20-inch wheel for the 2013 model year and engineered to the highest standards. Standard 10-spoke wheel is black with a low-gloss clear coat, forged alum and has the CAMARO logo. These wheels are 11 lbs. lighter than the current 2SS model wheels. 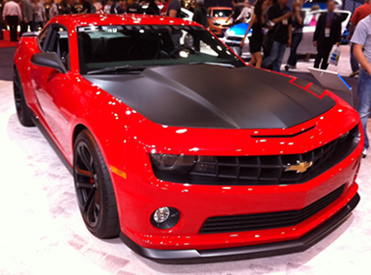 ZL1 high-capacity fuel pump and additional fuel pickups for fuel delivery during high-load cornering. The 1LE package features a matte black hood graphic manufactured and warranted by 3M. To maintain the appearance of the graphic, hand washing or a touchless car wash is recommended. Tip: Do NOT polish or wax the graphic. Using polish, wax or any solvent-containing products will discolor the graphic. The hood wrap on this vehicle is not a GM warranty part. Owners are directed to contact their dealer for any warranty claims. The warranty form for this graphic is included in the glove box of the vehicle. Dealers are to arrange an assessment of the claim with 3M.